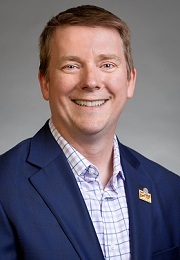 Certainly, this week’s “don’t miss” event is the Dean’s Distinguished Lecture with alumnus Trey Winthrop, the chief financial officer from Bob’s Red Mill. The Milwaukie, Oregon company is an employee-owned operation that places high value on people and relationships. Winthrop will discuss how the company balances growth, strategy and processes in such an environment. RSVP and reserve your place for the Fri., April 14, 10 am event in Stirek Auditorium (Austin 183). In conjunction with the Austin Family Business Program, Fridays in Austin events will center on the workings of successful family businesses. You can hear from Travis Boersma, president & co-founder of Dutch Bros. Coffee (and runner-up for “don’t miss” event of the week! ), who started the company with his brother. RSVP for his talk here. Other events include a discussion panel of financial advisors focused on positioning family businesses to succeed for future generations. Review the Family Business Day page for more details. It’s an all-star lineup! Also, design students, today is the last day to sign up for the Senior Mentoring Event. This Portland event pairs seniors in apparel design, interior design, graphic design, or merchandising management with a professional in the student’s field. Apply with your resume. We’d like to say congratulations to Steven Miller and Moriah Shay! They are among the honorees receiving the Outreach and Engagement Vice Provost Award of Excellence for their “Thinker Tinker Trailer, The College of Business Mobile Makerspace.” In addition to the accolades associated with recognition as one of 10 outstanding examples of outreach and engagement work at Oregon State, they have won $1,000. As well, let’s congratulate Nathan Braaten, who won the InnovationX PitchFest for his work creating wearable jewelry embedded with a safety alert system. Remember, all of our news and events information highlights are in The Works, so don’t miss it! Experian Chairman Don Robert, second from right, with Prof. Anthony Klotz, left, and the students who accompanied him to London this summer. Prof. Anthony Klotz’s second summer of leading College of Business students through a course in cross-cultural management in London carried an additional benefit: This year’s group had a front-row seat to history as the United Kingdom opted for Brexit and voted to leave the European Union. 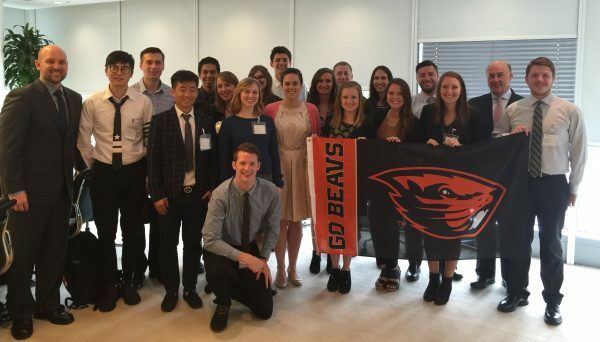 “We arrived in London about a week before the polls closed for the Brexit vote,” said Troy McCool, one of 18 students who accompanied Klotz on the three-week trip, a partnership between the College of Business and INTO; INTO is an OSU partner that helps facilitate international education. As they did in 2015, Klotz and his students met with College of Business alumnus Don Robert, chairman of global information services giant Experian. Robert is also on the board of the Bank of England, the British equivalent of the Federal Reserve. London voters, the ones most often encountered by Klotz and the students, were 59.9 percent in favor staying in the EU, and Scotland and Northern Ireland were also heavily in favor of remaining. But nine other regions voted 70 percent or greater to exit, and England as a whole was 53 percent in favor of Brexit, resulting in the overall 52-48 breakdown. In addition to Robert, Klotz’s students heard from Simon Sproule, chief marketing officer of British car maker Aston Martin. Joining McCool on the student roster were Alexandra Martino, Jennifer Duffy, Sara Black, Sophie Clarke, Ryan Lonsway, Joshua Whittle, Danielle Lacombe, Lauren Becker, Chengrun (Daniel) Deng, Meaghan Connelly, Zack Hermann, Megan Wheeler, Dehuai (Sean) Xiao, Heidi Peterson, Dominic Carrier, Isai Garcia and Duncan Miller. Kenna Hanson, senior to be in interior design, has an internship this summer that she’s been preparing for almost half her life. Hanson is working for Tiffany Home Design, a key vendor on the 6,275-square-foot “Quintessence” home in this year’s NW Natural Street of Dreams. Hanson, who grew up in southwest Portland, traces her roots as designer to age 12. 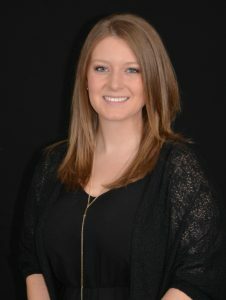 The interior design program within the College of Business has helped put her on the cusp of launching a career in her aspirational field of residential design. This year’s Street of Dreams, the 47th edition of the event produced annually by the Home Builders Association of Metro Portland, features five homes in a vineyard development on Pete’s Mountain in West Linn. It opens July 30 and runs through Aug. 28. Tickets to view the work of all of the builders and design professionals are on sale now. “The houses are all built and it’s up to us to place the pieces and stage them to bring most attention to the home as well as show everyone what we can do to the best of our abilities,” Hanson said. Posted in Career Success Center, Student Highlights. DiscJam founder Alex Dassise fires away with his throwable speaker. Teams of student entrepreneurs from the College of Business’ Austin Lab program closed their 2015-16 competition season by taking the top two spots at the fourth annual Civil War Shark Tank held recently at the University of Oregon. Austin Lab is part of the college’s Austin Entrepreneurship Program, which aims to train startup-minded students in design thinking and innovation management and provide them with resources and mentorship. Placing first in the Shark Tank were Alex Dassise and Spencer Kleweno, whose company, DiscJam, is a designer and manufacturer of flying speakers that incorporate an MP3 player and Bluetooth speaker into a throwable disc. DiscJam has begun selling a beta version of the product and is part of the summer 2016 cohort at the Advantage Accelerator, OSU’s business incubator. Dassise, who just finished his freshman year, developed the product as a means of connecting and communicating with his younger brother, who’s autistic. Sales are under way on a beta version of the flying speakers, which are proving popular with college students. Dassise also hopes DiscJam will catch on in the autistic community, enabling autistic people and their loved ones to better engage with each other. “Throw your favorite music” and “connect through music and motion” are two of the company’s slogans. Coming in second were Steven Miller and Moriah Shay of Enterprising Education, which has already raised more than $30,000 to build a mobile makerspace and develop K-12 curriculum in science, technology, engineering, entrepreneurship and math. Miller and Shay intend to train undergraduates to run their own socially focused microenterprises that will provide experiential learning opportunities, mentorship and college preparatory resources to students in rural and/or lower-income school districts. 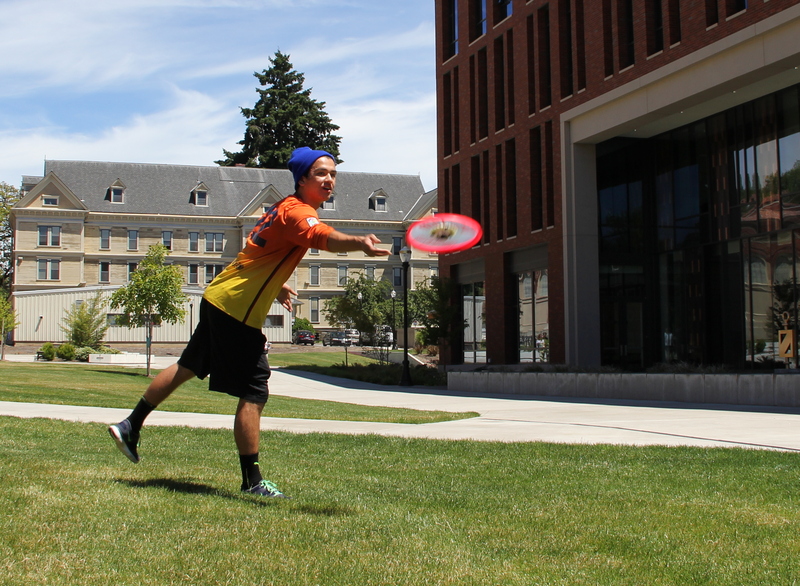 DiscJam took home $1,000 for finishing first, and Enterprising Education pocketed $650. OSU students from the Entrepreneurship Club took the top three spots in the elevator-pitch competition held in conjunction with the shark tank. “I am very proud of all of our students and I think this has been a great way to cap off our entrepreneurship competitions for 2016,” said Dale McCauley, program manager for the College of Business’ Austin Entrepreneurship Program. Posted in AEP, Student Highlights. 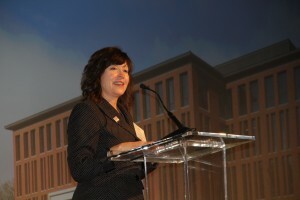 Oregon State University President Ed Ray and Sara Hart Kimball Dean Mitzi Montoya both noted the challenges and importance of accessing higher education May 2 during the College of Business’ Impact at Work event at the Portland Hilton and Executive Tower. The reception and dinner, attended by 150, were aimed at honoring scholarship recipients and the donors who help fund their education. Student success is a top initiative of both the college and the university. Ray pointed out that young people who grow up in families in the lowest quartile of income distribution have just a 9 percent chance of accessing higher education — that’s a better chance than 40 years ago, but only 3 percent better, and he and Montoya are determined to speed up the rate of improvement. Montoya, who was a second-generation college student in her family, noted that when someone can break through and become the first person in his or her family to graduate from college, it changes the family for the better for generations. Other speakers included Presidential Scholar Annemarie Lewandowski, a senior in management who will go to work for Boeing as a project manager following graduation, and Dean’s Council of Excellence member Ken Thrasher, former chief executive officer of Fred Meyer. Lewandowski expressed gratitude for being able to graduate debt free, and Thrasher noted how he hadn’t planned on going to college until his mentor, legendary Portland businessman Bill Naito, helped make it possible — with the proviso that he work hard, do well and then similarly help others someday. The evening also included recognition for six high school juniors selected for the College of Business’ Future Business Leader Scholarship. Posted in Career Success Center, Events, Student Highlights. The winning team makes its pitch to the sharks. 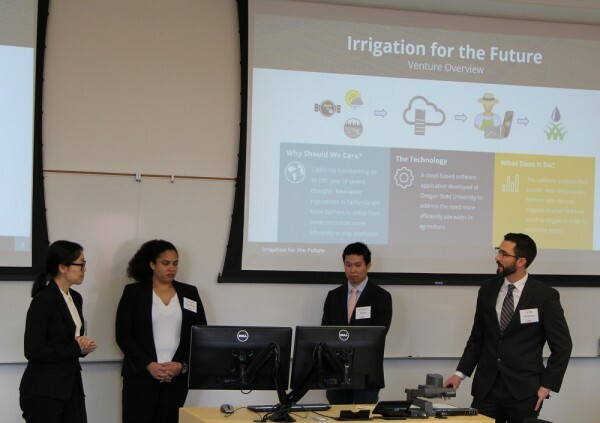 A team proposing a business built around software for maximizing irrigation efficiency was the overall winner April 8 at the College of Business’ 14th annual MBA Business Plan Competition in Stirek Auditorium. Developing the plan for the company, called Irrigation for the Future, were Andy Roberts, Yang Wang, Vincent Dijoe and Easton Henrikson. Placing second was the h2know team of Keith Robertson, Ying Pan, Christina Kreps and Abdulsalam Alhawsawi, and third was X-Bubble: eXtreme heat eXchange, featuring Robert Shattuck, Qi Liu, Jingjing Jia and Chao Feng. H2know’s product was a wearable hydration assessment tool, while X-Bubble deals in nano surface structures for advanced heat transfer. In the Elevator Pitch and Shark Tank portion of the competition, the order of finish was X-Bubble, Irrigation for the Future, and h2Know. Shattuck, of X-Bubble, was the top Elevator Pitch presenter. The College of Business extends a big thank you to the judges and sponsors. 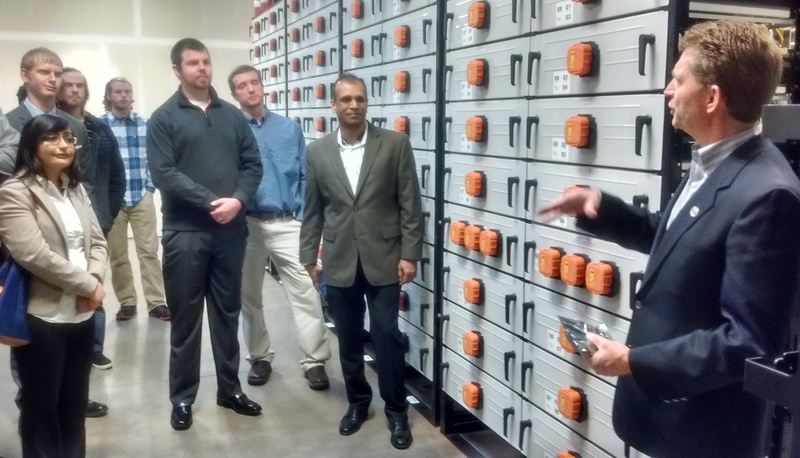 Kevin Whitener of Portland General Electric, right, addresses the tour group by the Beaver-colored bank of batteries at the Salem Smart Power Center. Closest to Whitener is tour organizer Pradeep Kumar of the Portland chapter of the Society of Information Management. About 20 business information systems students from the College of Business took a two-hour tour of Portland General Electric’s Salem Smart Power Center on Feb. 10. The tour was the annual BIS field trip arranged through the Portland chapter of the Society for Information Management. Pradeep Kumar of Portland SIM was the organizer. The power center is a new battery storage facility and part of the larger Pacific Northwest Smart Grid Demonstration Project. The Bonneville Power Administration calls the center a first-of-its-kind facility and one of the most advanced electrical systems in the nation. Rene Reitsma, BIS professor at the College of Business, describes the Smart Power Center as a five-megowatt bank of lithium-ion batteries used “to smooth out supply and demand and store renewable energy.” In the event of a citywide PGE outage in Salem, the grid-tied batteries could meet the needs of every customer for 15 to 20 minutes, long enough to get backup generators online. 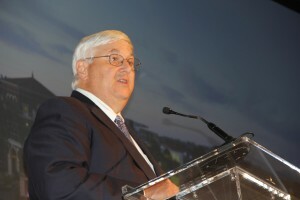 Reitsma said the tour focused on the vast IT requirements of the battery system, which according to the BPA involve 67 separately addressed Internet devices communicating on two different networks within the facility. Joining the College of Business students on the tour were students from the University of Portland, Oregon Institute of Technology, and the University of Washington-Vancouver. 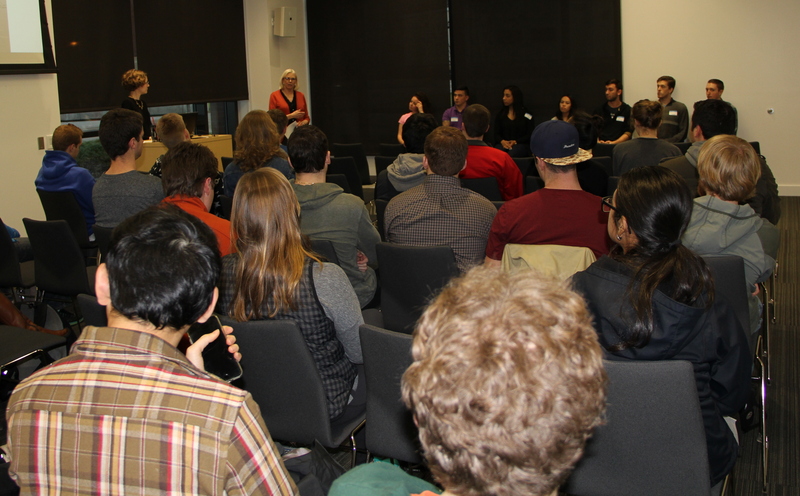 A panel with first-hand experience shares advice about studying abroad. Twenty-six College of Business students turned out to the Robert Family Events Room on Jan. 21 to learn about studying abroad from a seven-person panel with first-hand experience. Immerse yourself in the culture. Be a sponge – absorb all you encounter. Remember that grades aren’t all that matter. Focus on the whole experience. Branch out and meet people. Making up the panel were Rachael Korbel, who studied in Italy; Jason Duncan (Norway); Ruby Sutton (Austria); Virginia Tat (Germany); Nathaniel Berry (Czech Republic); Mark Scheidler (Denmark); and Stefan Herrenbruck (Austria). Korbel is a design student who took part in a study abroad program at fashion and design school Accademia Italiana. The remaining students on the panel went abroad via the Arthur Stonehill International Exchange Program, a partnership between the College of Business and universities in 12 countries; the others are Australia, Norway, Singapore, Spain, Sweden and Thailand. Also available, for design students, is an exchange program at Hanyang University in South Korea. Click here for more information about international opportunities. Welcome to 2016 at the College of Business, and we wish all of you the greatest successes in the year ahead. — Guest speaker lineup that includes design-thinking guru Barry Kudrowicz, international business CEO and ethicist Joe Lobbato and Israeli diplomat Ido Aharoni entertains and enlightens Austin Hall audiences. — Online/Portland hybrid MBA program produces first class of graduates. — Seaweed that tastes like bacon, the subject of an MBA student group’s integrated business plan, takes the nation by social media storm (the celebrated plant is known as dulse). — Business Expo packs every floor of Austin with potential employers. — Change in leadership atop the college as Mitzi Montoya takes over as dean following Ilene Kleinsorge’s retirement. 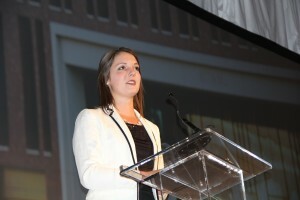 — OSU students dominate Duck counterparts in Civil War Shark Tank. 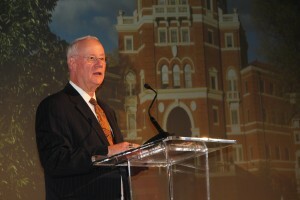 — Celebration of Excellence crowns new Hall of Famer (Stephen Bailey) while honoring college’s best and brightest. — Oregon State Investment Group contingent meets “King of Private Equity” Stephen Schwarzman during annual trip to New York. Best of the rest: COB alum Jaymes Winters serves as the kickoff speaker at the opening of the Lonnie B. Harris Black Cultural Center; OSU Advantage Accelerator continues work with entrepreneurs, startups; employers fill loge level at Reser Stadium to network with students. Posted in Alumni Highlights, Faculty Highlights, Student Highlights. 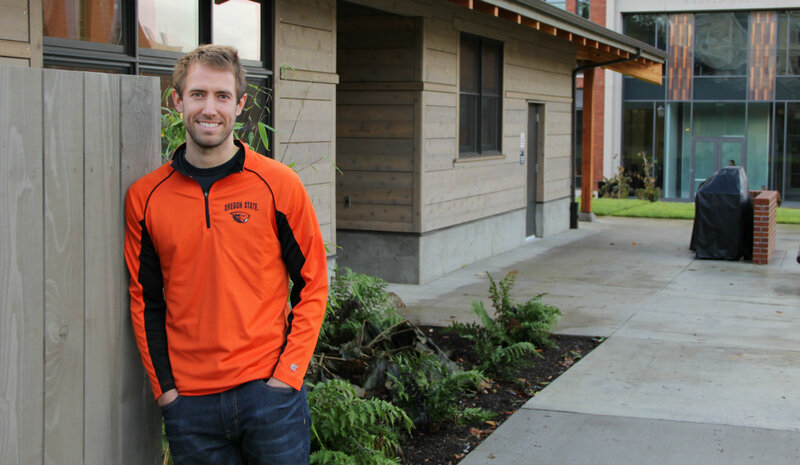 MBA student Keith Robertson is wrapping up his first term in Corvallis after moving west from Missouri. Keith Robertson of Kansas City, Mo., had never been to Oregon before deciding to pursue an MBA in commercialization at Oregon State University beginning fall term 2015. The owner of a bachelor’s degree in marketing from the University of Missouri (class of 2012), Robertson is loving his time in the Beaver State, even if it did mean being 2,000 miles away from the Royals’ World Series celebration, and even if the Corvallis weather has gotten a bit damp of late. “When I was looking at grad schools, I had a few criteria, and one of them was an accelerated program. OSU does a good job of catering both to students to have to keep working and who want to be full-time students, so for me I could be here nine months, get in, get the knowledge I was looking for and get back into the job world. “Another area that’s different from other schools is here you can specialize down a track. Other universities offer MBAs that are more generic, so if I could leave here with a major and an emphasis, I thought that would be useful. “It’s extremely fast paced. I’m taking five courses per quarter, so it’s like more than a full workload, but an accelerated program was one of my primary criteria, and I enjoy my teachers and my classes.